There are also many other types of parking signs in our store. Click HERE to see them all. Reflective signs are more easily seen at night and are still nice and bright during the day. Class 1W is Prismatic wide angle reflective. National Safety Signs are committed to produce high quality signs. All our products comply to National Australian Standards. You can have your sign laminated for extra protection by clicking on that option on this page. 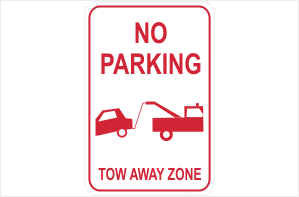 This No Parking Sign is available in Steel, Aluminium, Polypropylene, Corflute or as a sticker. There are also various sizes available. Aluminium is 1.6mm thick and the steel is a .55mm enamel coated signwhite colourbond. None of our signs have any holes drilled in them, but we are quite happy to do so for you. Just leave instructions in the ‘additional instructions’ text box of where and what size holes you would like drilled. Please refrain from using ‘construction adhesive’ or similar glues on Polypropylene signs as this will distort them. 2PM Australian Eastern Standard Time is the cut off time for stocked signs to be sent same day. Not to worry though, next working day usually see all orders being sent. If you want your sign laminated, it may delay it an extra day. National Safety Signs is located in SE QLD and ships all over Australia.